Let’s be real. It occurs more than 5,400 home intrusions every day in the USA. In 2013 alone, $4.5 billion was lost in property due to burglaries. This is scary facts and should be a wake-up call for everyone that has unprotected valuables. If you want true protection for your guns against burglars you can’t settle with a mediocre gun safe. The only safe that has the potential to stop even the most advanced burglar is the best superior gun safe. What is a Superior Gun Safe? A superior gun safe is the best high-end gun safe you will find on the today’s market. These safes are built to protect your most valuable guns and priceless heirlooms. To do this, they are equipped with the thickest steel and the best security features. Features such as a hard plate, relocking devices, and a U.L. rated lock is a certainty when it comes to the best superior gun safe. You can also bet that they have fire protection certified by an independent agency such as U.L. or ETL. 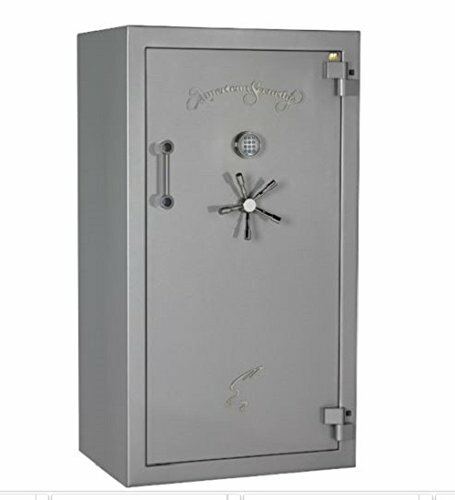 At the first and second place, we have two Amsec gun safes from the popular BF series. We absolutely love these gun safes and they are a popular choice for serious gun owners. 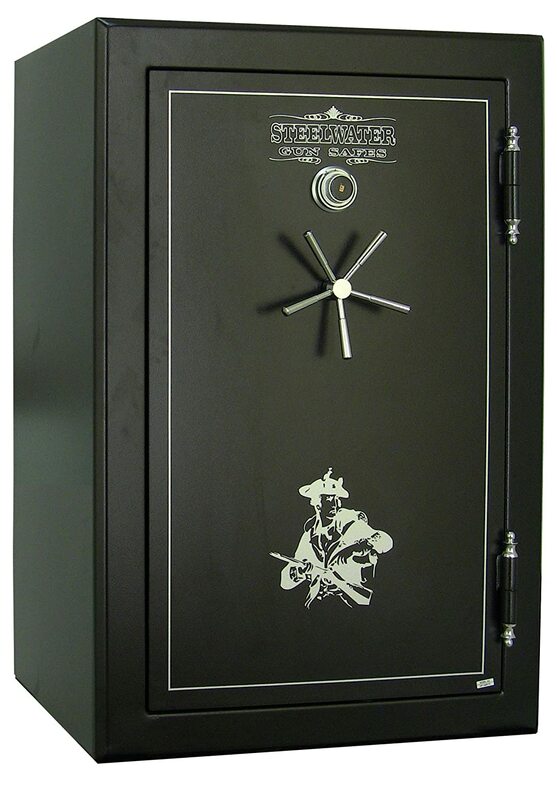 These gun safes have extremely thick steel, the best security features, and great usability. Perhaps best of all, they are made in the USA, unlike the majority of the other gun safes that are made in China. Say hello to the beautiful and massive American Security BF7250 safe. This high-quality gun safe is made in the USA and is – without a doubt – the best superior gun safe in 2017. When it comes to the steel and its security features – it won’t get much better than this. If you want to protect your most valuable guns and heirlooms – this is the best storage solution for you. 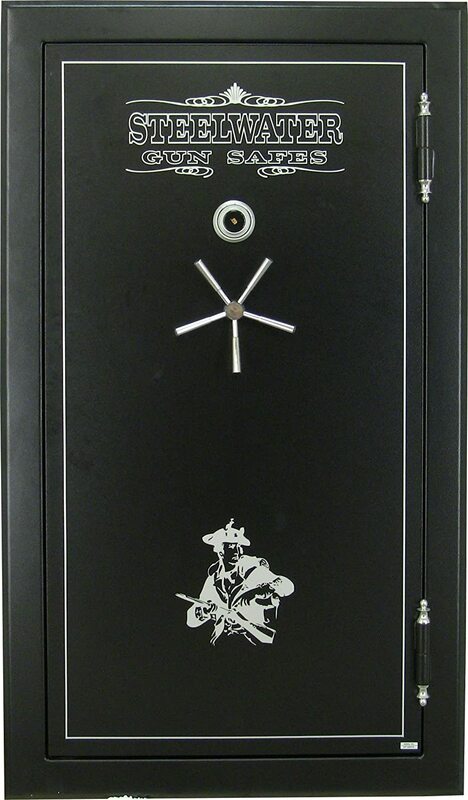 This premium gun safe is extremely sturdy with its 3/8″ thick steel door and 7 gauge steel body. It would require an immense force to penetrate the thick steel walls of this high-end gun safe. The walls are also filled with 2″ DryLight insulation which gives exceptional fire protection. It has been confirmed by ETL that it can withstand temperatures reaching up to 1200F for 2 hours. To add strength against prying attacks it has a smooth cam driven locking system with 12 1½ chrome-plated steel locking bolts. It also features a hard plate and two relockers to protect the U.L. Listed Group II dial combination lock against drill and punch attacks. Additionally, it features an interior light kit, a convenient extra pull handle, and a back wall mirror. On top of that, you will get a premium door organizer and an AC power outlet to power a dehumidifier, interior lights, or stored gadgets. All in all, this is a feature rich monster with a great mix of security, size, and usability. If you want the best superior gun safe – this is the one. Do you like the idea of a superior gun safe made in the USA but want a more inexpensive alternative? Check out the American Security BF6636 Safe, which is a smaller version of the BF7250. Since the Amsec BF6636 is also part of the BF series it shares many features with the BF7250. The few differences between these gun safes are illustrated in the table below. If you cut the price of the Amsec BF7250 in half, you will get the Steelwater Extreme Duty 45 Long Gun Safe. This superior gun safe offers great protection against burglars and has room for up to 45 long guns. All your firearms and valuables will be well protected in the 9 gauge steel body and behind the 3 gauge steel door. The security of the door is further enhanced by a gear drive locking system with the 18 1½ steel locking bolts. This sturdy gun safe is virtually impossible to pry open. The security of the U.L. Listed Group II dial combination lock is also top notch. A hard plate that is 8 times larger than its competitors protects the lock against drill attacks. Additionally, the two relocking devices will add protection against tampering and punch attacks. Beside great protection against burglars, it also offers 2-hours fire protection at 1875F. There are also 1/4″ steel plates in each anchor holes for added strength when bolted down. To avoid damaging your stored long guns the entire interior is decorated with a soft gray carpet. Last but not least, it features a U.L. Listed outlet with 3 AC sockets and 2 USB ports. 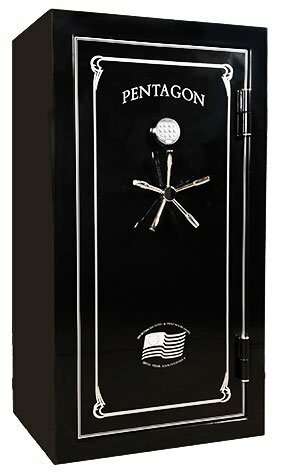 Next up on the chopping block is the Frontier by Pentagon Safes, which is another great American gun safe. Pentagon Safes claim to be the number one manufacturer of fireproof gun safes in America. And when you see the Frontier, you can understand the meaning behind those words. It has a 2.25″ firewall on all six sides of the safe, giving your long guns 90 minutes fire protection. Talking about long guns, you will be able to fit up to 40 of them in this spacious gun safe. It doesn’t matter if you own oversized firearms such as an AR-15 or a Barret .50 caliber – they will all fit nicely. It’s also very sturdy with its 10 gauge steel body and a door with 3 layers of steel to protect the S&G dial combination lock against drill attacks. With 12 1¼” steel locking bolts and a 3/4″ anti-pry steel frame it’s also well protected against pry attacks. To protect the lock against tampering and punch attacks it has two relocking devices. The interior is fully convertible, which means you can arrange the shelves to fit your needs. It’s also fully carpeted with gun racks to house all your long guns. The 5th best superior gun safe on this list is the Steelwater Extreme Duty 39 Long Gun Safe. This is the best gun safe you can get under 2000 dollars and will serve as the best budget option. 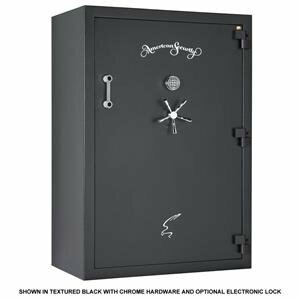 Remember the Steelwater Extreme Duty 45 Long Gun safe we have listed at third place? This Steelwater gun safe is a smaller version of that safe, thus they will share many features. The few differences between these great gun safes are illustrated in the table below. Hope for the best but expect the worst, and it’s better to be safe than sorry. These are expressions we are awfully familiar with, and there is a lot of truth behind these words. Try to imagine how it would feel to come home to notice that all your guns and heirlooms are gone. The sudden realization that all the money that you have spent and all the memories – vanished, just like that. It’s a devastating thought and something that most people would like to avoid if possible. In this article, we present you with five solutions that will give you the best protection for your guns. They say that all safes have a purpose and the purpose of the best superior gun safe is to protect your most precious valuables.